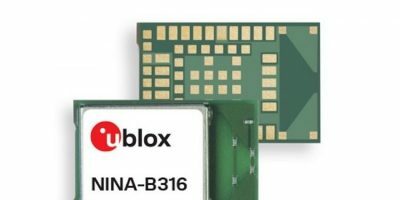 Bluetooth 5 low energy modules in the Nina-B3 series, by u-blox, now include the Nina-B306/316 modules with integrated PCB antenna. The trapezoidal printed antenna, using technology licensed from Proant AB, is claimed to enable superior performance transmission and reception of data in a small form factor. Bluetooth low energy (BLE) is increasingly popular for short-range wireless technology in IoT applications, thanks to its security and robustness, coupled with higher data rates, longer range, support for mesh networking and exceptionally low power demands. By moving the antenna to the PCB, manufacturers can now implement the Nina-B3 family into even smaller form factors, explains u-blox. The NINA-B306/316 modules are pin- and software-compatible with the entire Nina series, for a seamless upgrade path and design options. Depending on the end application, an external antenna may be appropriate, while for other, a PCB antenna will offer technical and commercial benefits. The Nina-B306/316 modules have a small form factor of 10 x 15 x 2.2mm. u‑blox provides positioning and wireless communication technologies for the automotive, industrial, and consumer markets to let people, vehicles and machines determine their precise position and communicate wirelessly over cellular and short-range networks. It offers a portfolio of chips, modules and a growing ecosystem of product supporting data services to support its customers to develop innovative solutions for the IoT quickly and cost-effectively. The company headquarters are in Thalwil, Switzerland, with offices in Europe, Asia, and the USA.